There’s SO much bold fashion going on in this picture from 1994. 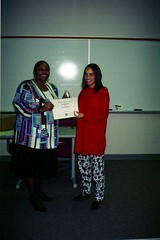 Bernell Prince (on left) with her boldly colored blazer to the mystery student (on right) with her Mickey Mouse pants. Which is your favorite?